Pig Finisher is a feeding option following grower or transition that enhances a softer look. 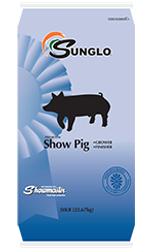 This 16% protein product is designed to add condition to pigs that are harder in their appearance. Pig Finisher is also the feed of choice for tighter made pigs that need added body and finish. Feeding Directions: Designed to be fed as the sole ration for pigs weighing 150 lb. to market.